did with our children’s area. 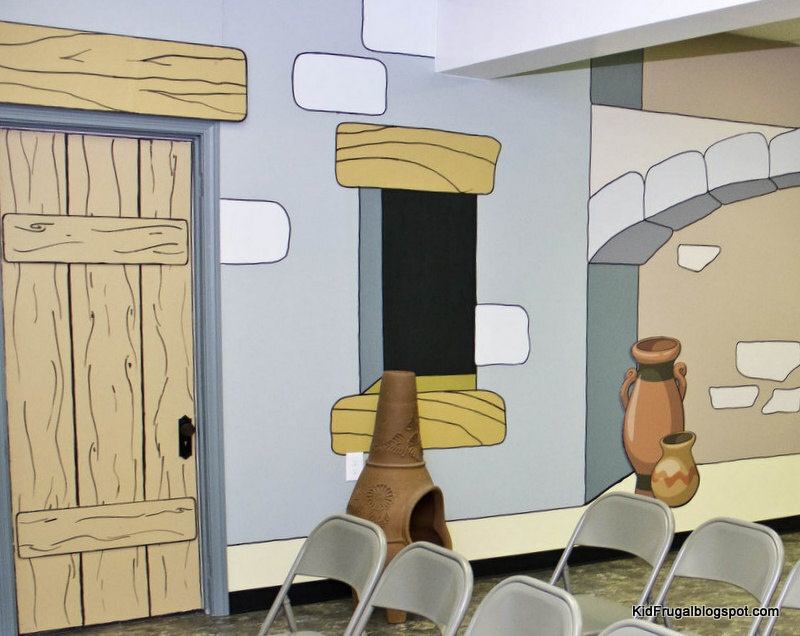 We used Creative for Kids to redo our children’s area. They used to offer an option where you could choose a theme, send them your wall measurements, and they would draw the designs for you. The advantage of this is that the designs are custom-fitted to your walls – both size-wise and obstacle-wise. You get a nice, cohesive picture with a theme that you chose. Currently, this option is not being offered. 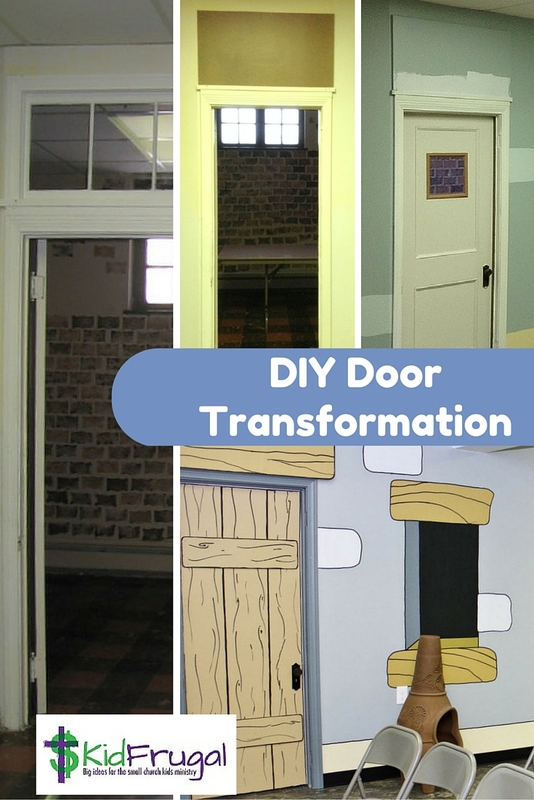 Today I just want to show you how we transformed the outdated doors we had. 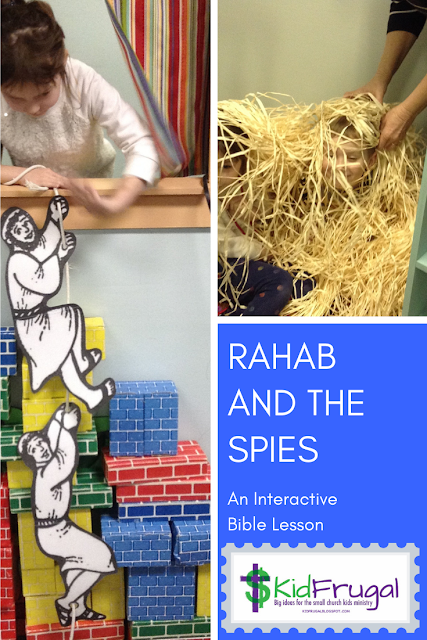 Watch for the other side of the room in part 3. 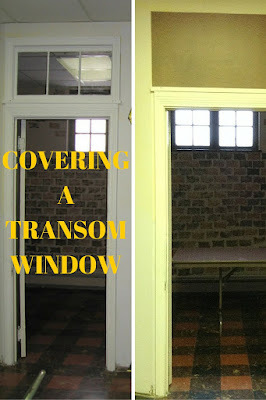 We began by covering over the transom windows with a thin sheet of Masonite board. Originally, we were not going to paint over our doors, but they were very old and kind of stuck out once the rest of the walls were painted. So we made three of them to look like Bible-times door. Our resident furniture maker covered the three Bible-times doors with ¼ inch plywood. First he primed BOTH sides of the plywood and then painted it the same color as the beams over the doors. The door knobs and back plates were removed and spray painted black. 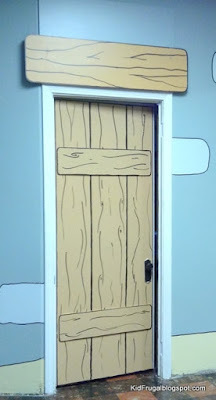 Then he staple gunned the plywood right onto the door and put the plates and knobs back on. He just used a Sharpie to draw the grain on free-hand. He added some cross beams for extra effect. Finally, we painted the door frame to match one of the inset colors on the nearby window. This was less expensive than buying new doors, and it added a lot to the look of the room. Next week we will look at the wall murals themselves.